In 1957, Arthur Andrew, a local resident of Adams County, Illinois, noticed a large "elephant tooth" poking from a bluff several miles southeast of Lima near the former bed of Lima Lake. As the Quincy Herald-Whig described on Sunday, April 20, 2008, "Andrew took the tooth home, and the mystery began sprouting. For 51 years, residents of the Lima Lake area have been hearing about the local mastodon tooth and wondering how old it might be." The director of North American Archaeological Institute in Quincy, Steve Tieken, received permission from the tooth's current owner to date this giant creature using the radiocarbon dating method. Hong Wang, director of the radiocarbon dating laboratory at the Illinois State Geological Survey, took on this project. Together with Stanley Ambrose, anthropology professor, Wang used a pencil-size drill with a diamond bit to grind a half-inch piece of tooth enamel from a corner of the tooth into fine powder. Tooth enamel typically contains different chemical compounds that can be used in the age-dating process. Bio-apatite was selected for dating the tooth because bio-apatite is made up of calcium phosphate crystals that, during the growth of the tooth, trap carbon dioxide within the tooth structure (carbonate). Wang combined the tooth enamel sample with an extremely weak acid (0.1 M acetic acid) for over 20 hours to prepare it for analysis. Afterward, the remaining sample material was mixed with a stronger acid to release the carbon in the bio-apatite. 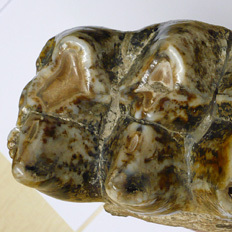 This released carbon was used to date the mastodon tooth. The results of the analysis gave an age of 10,775 ± 35 14C years before present. Surprisingly, this mastodon specimen is the youngest ever dated, suggesting it could represent the "last mastodon standing' on the North America continent. On June 1, 2008, the Quincy Herald-Whigreported this result. Now Lima Lake residents wonder what caused the demise of the furry mastodon. Steve Tieken is currently examining clues such as scratch marks on a vertebrate found next to the mastodon tooth, which may indicate human butchering of the carcass. ISGS scientists have offered to analyze this bone specimen to confirm the age of the mastodon and verify if it is the youngest known mastodon found in North America.